(next entry) RhinoCAM “Get’s the Job Done” at T-FAY TECH! Pete Sorenson is a retired technology instructor with 42 years in the classroom. Currently, Pete conducts workshops and teacher training for Robert McNeel & Associates and has been using RhinoCAM® for over 5 years now. 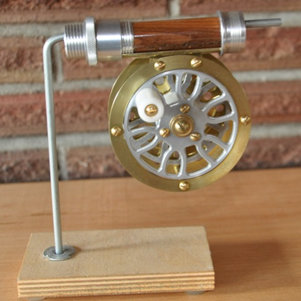 The fly reel design shown here was inspired by Michael L.J. Hackney’s book The Reelsmith’s Primer: The Art of Hand-crafting Fly Fishing Reels (The Whitefish Press (Cincinnati, OH) (2010). The brass and aluminum components in Pete’s fly reel design shown here were machined using RhinoCAM® toolpaths. Note the pocketing and contour detail in the aluminum side plates machined using a 1/16” end mill.